Thickness: 1/2", Dimensions: 60" x 96"
King StarLite®XL is an economical cellular (closed cell) utility sheet made from select high-grade King StarBoard® recycled polymer material. It is ideal for boat parts, as an upholstery substrate and in other behind-the-scenes applications where edges aren’t visible. King StarLite® XL is up to 35% lighter in weight than King StarBoard® and it offers the same quality textured surface on both sides. Available in Utility Gray. King StarLite®XL is made entirely from FDA and USDA approved materials. Environmentally stabilized to withstand tough marine conditions. Matte textured on both sides. Will not rot, swell or delaminate when exposed to humidity or water. Resists odor, even in wet environments. An excellent substrate for mounting instruments. Able to securely hold staples and screws. The perfect lightweight replacement for plywoods or MDF. 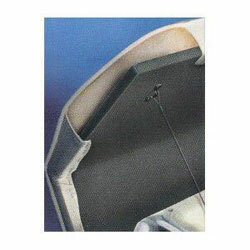 Flexes without breaking, unlike plywood or PVC foam products. Perfect for upholstered parts. Bends without breaking. Easy to fabricate using standard woodworking tools. This material should be used in applications where color match and edge finish are not critical. King StarLite®XL is made entirely from FDA and USDA approved materials. Click here for Tips on Working with Starboard.